Microsoft Windows 7 Administrator’s Pocket Consultant focuses on system and user issues for Windows 7, featuring in-depth coverage of Windows 7 issues such as Windows desktop customization, mobile networking, and Group Policy. The book covers everything you need to know to perform core administration tasks for Windows 7. Find the Windows 7 page... click here. Ounce for ounce and dollar for dollar, the Pocket Consultant series from Microsoft Press is one of the best values around. The editors do a good job of recruiting competent authors and having them comply with well-thought-out style and formatting rules. Microsoft Windows Administrator's Pocket Consultant is one of the gems of the series. Author William Stanek has spent time working with his subject--this book wasn't rushed to market to match the Windows release date--and he's good at revealing its administrative procedures clearly and concisely. The book is nicely indexed, so locating the section you need takes very little effort. This book--slightly larger than a paperback novel--is ideal for a harried administrator responsible for many different software products, as well as for consultants who need to learn how to use Windows in a hurry. A particularly nice characteristic of Stanek's style: His skill at combining straight procedures ("Just follow these steps and it'll work") with supplementary information about options ("On the other hand, if you're doing something unusual, you might need to modify the standard procedure a bit"). As no real-life installation of Windows ever seems to match authors' ideas of normalcy, the supplementary information is critical. Screen shots are nicely handled as well. Their presence helps clarify what the text means, but they're not so large as to waste space. Whether you're upgrading your entire enterprise or simply buying new PCs on an ad hoc basis, Windows is coming into your enterprise. If you're responsible for supporting or administering it, this handy pocket guide offers you more useful answers per ounce than any other book we've seen. It's especially strong on Windows' new administrative features, and those really important tasks (like setting up desktop VPN connections) that you won't do often enough to memorize on your own. The book's organized into four sections: essentials, core administration, networking, and optimization/recovery. In 350 pages, it manages to be remarkably complete. Want to use Windows' new Remote Assistance feature to resolve users' problems without leaving your computer? Prohibit users from setting up Internet Connection Sharing on your DNS domain? Set a new home page for all your users at once? Place custom content on each user's desktop? Use System Restore across a network? Lock the taskbar, so it can't be moved or lost? William R. Stanek walks you through all these tasks, and more. 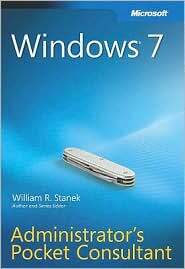 The practical, portable guide to Windows® 7! Whether you support 50 desktops or 5000, this indispensable guide provides fast answers for the day-to-day administration of the Windows® 7 operating system. This pocket-sized resource zeroes in on essential desktop support issues and procedures—delivering critical details through quick-reference tables, step-by-step instructions, and lists. It's the precise information you need to solve problems and get the job done—whether you're at your desk or in the field! To pack in as much information as possible, I had to assume that you have basic networking skills and a basic understanding of Windows operating systems. With this in mind, I don’t devote entire chapters to understanding Windows basics, Windows architecture, or Windows networks. I do, however, cover desktop customization, mobile networking, TCP/IP configuration, user profiles, and system optimization. The book also goes into depth on troubleshooting and I’ve tried to ensure every chapter, where appropriate, has troubleshooting guidelines and discussion along with the core text. Thus rather than a single catchall troubleshooting chapter inserted as an after thought, the troubleshooting advice is an integrated part of the book from start to finish. I hope that after reading these chapters and digging in to the details, you’ll be able to improve the overall experience of your users and reduce downtime. Windows 7 Administrator’s Pocket Consultant is designed to be used in daily administration, and as such, the book is organized by job-related tasks rather than by Windows 7 features. The books in the Pocket Consultant series are down-and-dirty, in-the-trenches books. Speed and ease of reference is an essential part of this hands-on guide. The book has an expanded table of contents and an extensive index for finding answers to problems quickly. Many other quick reference features have been added as well. These features include step-by-step instructions, lists, tables with fast facts, and extensive cross-references.